Are you flying in to OR Tambo Airport for a few days in Johannesburg before catching your domestic flights on SAA to Cape Town, Durban or Mpumalanga’s top wildlife hotpots? Are you looking for a quick and easy bite after a busy day exploring the Witwatersrand sights during your break? Chances are you don’t know where to find the best restaurants in town. There’s nothing like a buffet if you’re looking for variety to suit every member of the family as well as excellent bang for your buck. Get the perfect introduction to African cuisine at this all-you-can-eat offering overlooking picturesque Zoo Lake. Head on over at lunch and dinner time on weekends for a taste of the continent’s fines fare. The spread includes homemade Moyo-style bread, West Coast mussels, 5 different salad options, tagines, potjies, and shisha nyama, as well as seafood and veg dishes prepared right before your eyes. Sides include South African favourites like samp and beans, phutu and Zulu cabbage. Afterwards, indulge in local delicacies like lemon meringue, Amarula custard slices,malva pudding and koeksisters. If you prefer a morning treat, Moyo does not disappoint with its Big Breakfast on Saturdays and Sundays with a host of all your best-loved cold and hot breakfast staples. Carnivore carves up a celebration of African eats every day of the week in Muldersdrift, that is strictly not for vegetarians. Here, you’ll hit the restaurant running, with delicious home-made honey bread and soup, and a selection of salads at the buffet tables. Next up there are venison meatballs, samosas and biryani, or chicken liver, pork sausage and pork rib up for grabs all served with phutu, shebo and baked potato – and that’s just the entrée. For main, you’ll be spoiled with 4 different types of venison, including crocodile, beef or pork along with a selection of all your favourite sauces. If you can make your way through all that, there’s still more to come. The dessert table groans under the weight of chocolate mousse, malva pudding, cheese cake and fruit salad with ice cream. If you’ve got SAA flights booked to one of South Africa’s many fine game reserves, it’s the perfect introduction to gourmet safari-style dining. If you fancy some farm-to-table fare, Monaghan Farm’s country style buffet is right up your alley. Enjoy 3 courses of gourmet eats while the kids munch on pizzas and enjoy themselves in the play area, riding their bikes or climbing trees out in nature. The Other Side dishes up a festival of down-home fare with flair including cauliflower soup, roasted pork shoulder, fresh roast chicken, lamb stew with honey, baked lamb patties with pine nuts and tahini, plenty of vegetarian sides and loads of finger-licking desserts. 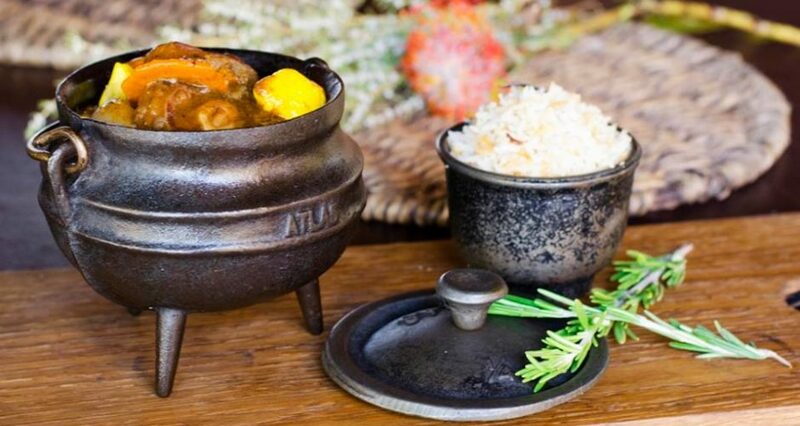 Krugersdorp locals have been taking a culinary journey back in time for years at this established themed eatery. Here you’ll find food fit for a king, queen and all the knights of the realm and it’s all on an eat-as-much-as-you can basis. Goblets of mead and trays of flatbreads, manchet bread, roast chicken, lamb and beef, and pottage are served banquet-style just like in the days of yore. To end off, gobble down a dessert of scrumptious apple crumble and rum custard. Add extra flavour by hiring a period costume on site to get into the swing of things and you’re all set for an unforgettable day or night out. Likewise, if you’ve got SAA flights booked to Durban, you can warm up your palate with Asian-style Sunday buffet temptations at Aroma Restaurant. Unfortunately, you won’t get to sample Durban’s signature bunny chows here, but you can expect a not-so-gentle introduction to traditional Indian cuisine at this Windsor Glen eatery. Mild and fiery curries, samosas, masala and biryanis in a range of meaty as well as vegetarian variations are all on offer. If you don’t have a spare afternoon to indulge, you can always try one of their takeaway options instead. Get your holiday off to a flying, feasting start with cheap flights to Johannesburg, Durban or Cape Town on SAA. It’s easier than you think to find affordable ways to fly. For starters you can go here to compare prices and book your passage to South Africa’s City of Gold. This entry was posted in Best Places in South Africa, Cape Town Flights, cheap flights to Johannesburg, Flight Specials, SAA Flights, South Africa Flights and tagged SAA Flights. Bookmark the permalink. ← Why Ride Your Bike To The Cape Town Cycle Tour When You Can Fly It There?